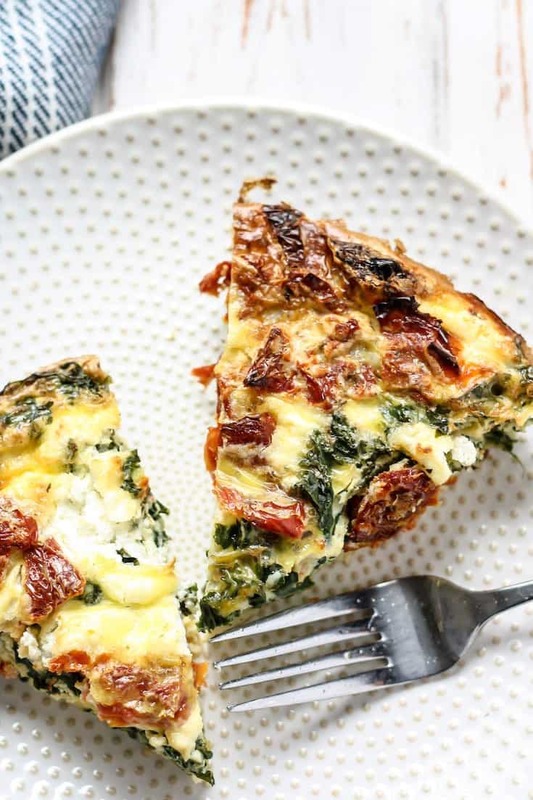 This Kale Goat Cheese & Sun-Dried Tomato Egg Bake needs to be on your brunch menu! 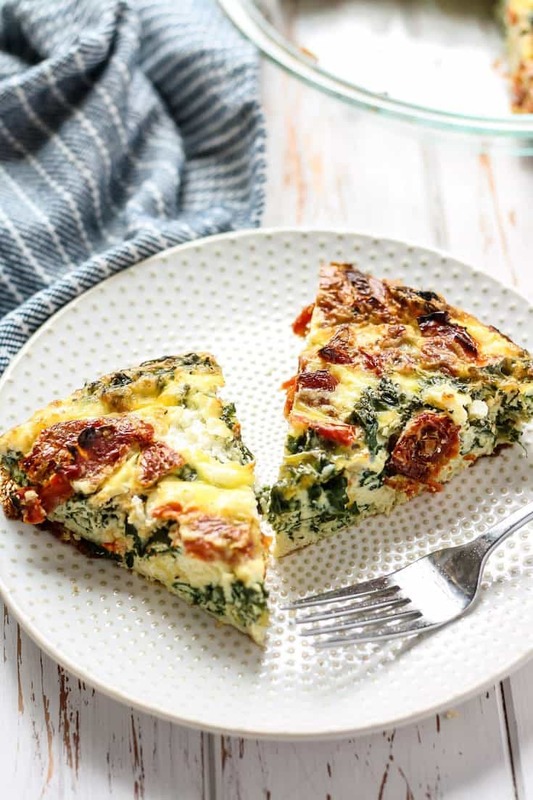 Using both whole eggs and egg whites, plus sautéed kale, goat cheese and topped with sun-dried tomatoes for a flavorful and tasty low carb dish. Speaking of frittatas, I had one of the BEST of my life at Mother’s Bistro in Portland. 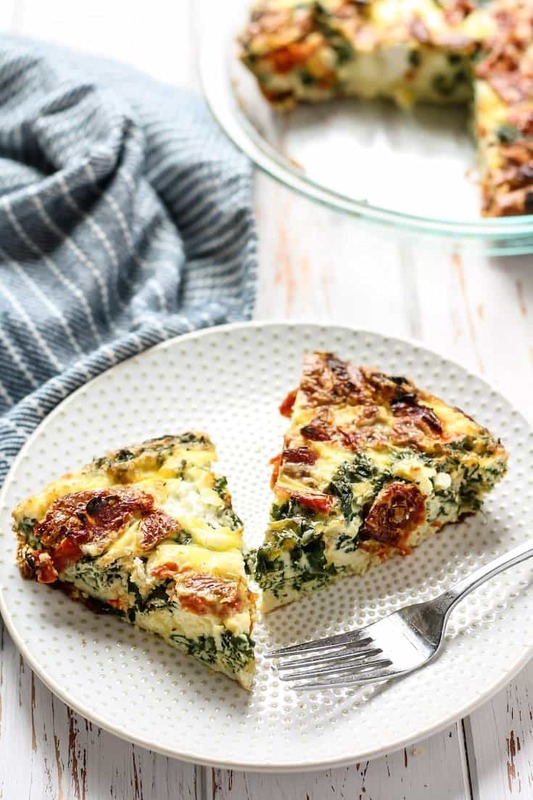 A Greek frittata made with spinach, feta, and sun-dried tomatoes (okay, technically olives too but I left those out). It was so fresh and delicious. Right then and there I decided I needed to try adding more sun-dried tomatoes in my life. My original goal for this recipe was to actually make a true frittata, i.e. starting the process on the stove then finishing off in the oven. But that would have required my cast iron skillet, which was no where to be found… so I settled for an egg bake instead since all I could seem to find was my pie dish. After you saute the kale until it’s cooked down, you just add the ingredients to your prepared dish in the above steps and bake at 400F for about 45 minutes. Super easy, and ready in less than one hour. I’ve been loving using the leftover sun-dried tomatos on my lunch this past week too 😉 Definitely need to get some more! Preheat oven to 400F. Grease a 9″ pie dish or square baking dish and set aside. In a medium-large skillet on medium heat, add about 1/2 TBS olive oil, minced garlic and kale. Cook and stir until kale is evenly coated in oil, sprinkle on sea salt here if you wish. Allow kale to cook down for about 3-5 minutes, stirring frequently. Remove from heat once kale has cooked down. In a large bowl, add whole eggs, egg whites, milk, seasoning, red pepper flakes, plus salt and pepper to taste. Whisk until evenly combined. 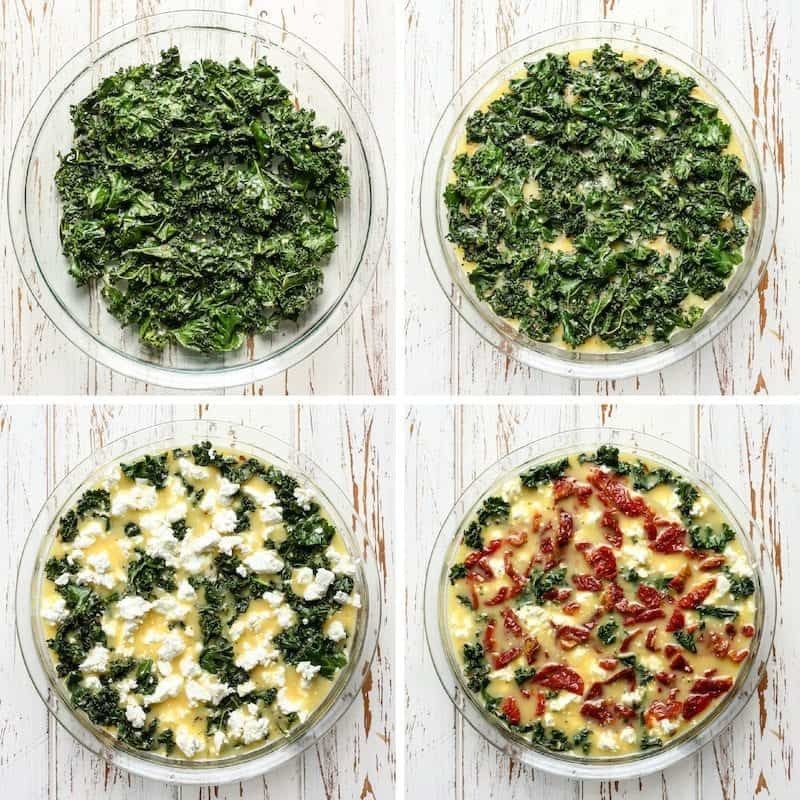 In your prepared dish, add kale, then egg mixture, then top with crumbled goat cheese and sun-dried tomatoes. Bake for 35-45 minutes, or until middle has set. Allow egg bake to cool for about 10 minutes, before slicing and serving. -This recipe may also be baked in a larger dish, such as a 13×9 pan, your egg bake will just come out thinner, and you will have to adjust baking time accordingly. -Wrap leftovers and store in fridge, up to 5 days. what’s your favorite way to enjoy your eggs? This is all I want in life. I am a huge fan of egg bakes and this is literally the perfect one for me. <3 #meanttobe I think I'm going to make my mom some ricotta pancakes this weekend! Egg bake love! Ricotta pancakes sound bangin’. This is what my breakfast dreams are made of! 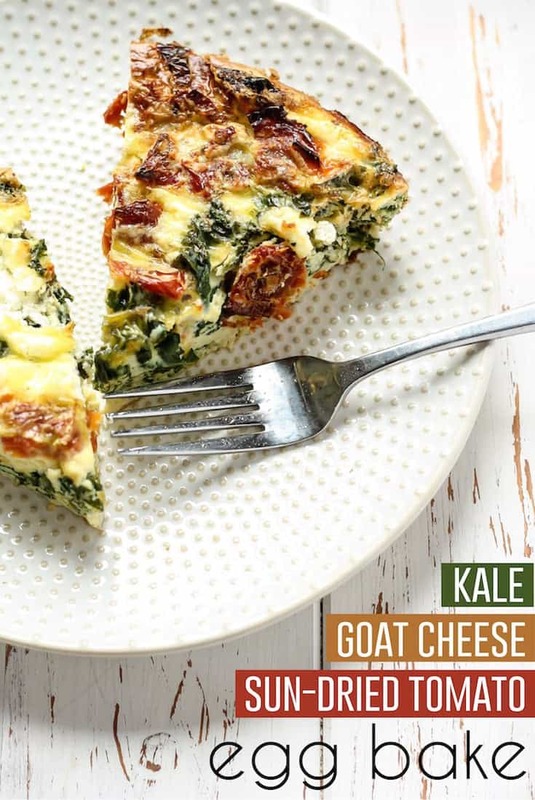 Kale, goat cheese AND sun dried tomatoes?! AND EGGS. Seriously, this is what I would order if I’d go out for brunch. We’re planning on taking my mom out for brunch because we do every year, but I also want to make something (still brainstorming, clearly!). GORGEOUS! I have quite the addiction to sun dried tomatoes and my mama loves goat cheese – this may just have to make an appearance at the brunch table on Sunday! I didn’t realize how much I loved sun-dried tomatoes on things until they came on a Cesar salad at one of my favorite restaurants. I love the chewy texture and the flavor combo it adds 🙂 I hope you make this! My favorite way to eat eggs is in a frittata, scrambled, poached, etc. basically any way! 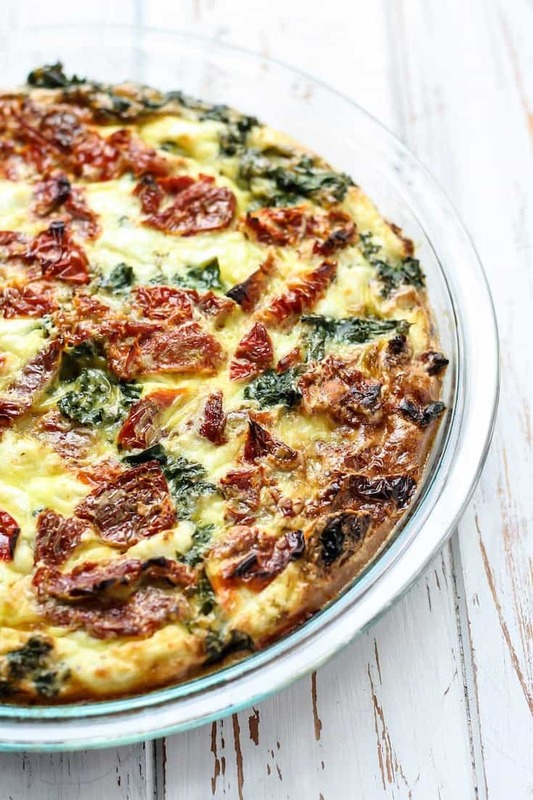 🙂 This egg bake looks fantastic though, I adore sundried tomatoes! I swear there is no better combo than sun dried tomato and goat cheese. YUM! Seriously it is so great! I’ve had it on little cucumber slices before at a friend’s house party. SO tasty. Girl this looks so good! We made an omelet like this at a cafe I worked at and got sick of the gross sundried tomatoes we used (past expiration???!! smelled so weird!!) but this looks so good I might be persuaded to try em again. ?? My mother’s actually NOT big on Mother’s Day, mainly because she believes every day should be Mothers Appreciation Day 😉 anyhow, this recipe is perfect for any brunch party or for meal prep when you’re in need of a quick breakfast, lunch, dinner or even a snack! So healthy, full of healthy goodness and of course, yummy flavors! I think goat cheese was made for eggy dishes like these. Especially when it’s all melty and delicious! Yum, yum, yum! guuuurl this looks so awesome!! i like how you had like every ingredient in the title hahah because i have all those ingredients. yay!! hope you have a great mothers day with the family. cant wait to see the feast!! Lol I had to put every ingredient because they were all so important! 😉 Thanks Beverley! Yesss I am like you! I can never pass up eggs. 🙂 I don’t know if I’ll be cooking anything on Mother’s Day this year! Hopefully Kyle does that for me this time! Heck yes I hope your hubby does the cooking for you, being a new mama! <3 I hope everything is going well for you and your family 🙂 Happy Mother's Day! Haha, it is definitely a great meal prep easy breakfast option (if you don’t mind warmed up eggs) 😉 Thanks Jess! These are some of my all time favorite flavors all together in 1 egg bake! 100% making this over the weekend! Ah yay! I hope you love it, thanks Diana! oh man, I love a good egg bake – especially one with goat cheese! Can’t wait to give this a try! Girl this has every ingredient I love in it!! Sounds delicious! Welllll since my momma lives so far away I can’t celebrate with her (sad face) BUT then that just means my hubby needs to step it up and totally pamper me the whole day, right?! I LOVE quiches and always looking for newbies to try. Of course, you nailed it! Yum! Enough said :). Pinned for menu planning. Did anyone make it yet?? Was it great?? Hi Susan! Sometimes people leave reviews on pinterest – I found some comments here: Recipe Review. Hope that helps! I prepped this the night before, added a small yellow onion, and baked it in the morning. I also did eight full eggs and added a little water, because I didn’t want to mess with egg whites. Quite tasty! Thanks so much for the feedback Katie!